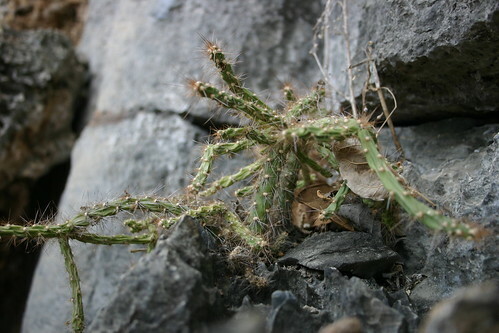 Quiabentia is an unusual cactus. It is rather thin for a cactus, and it has leaves. The genus was made in 1923 by Britton and Rose in their Cactaceae. It has only two species. 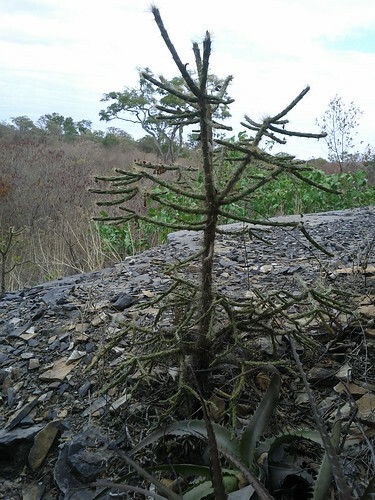 One, Q. verticillata, is wide-spread in Argentina, Bolivia, and Paraguay. 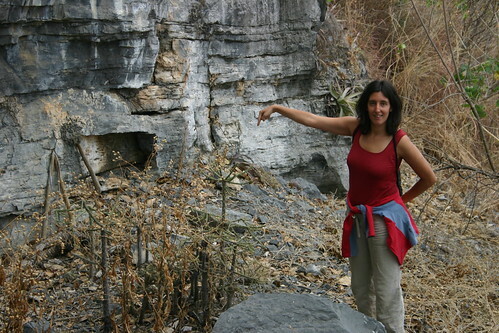 The other, Q. zehntneri, grows some 2000km away in an isolated well-defined habitat in Brasil. It grows near the southern river São Francisco in the provinces of Minas Gerais and Bahia. The landscape there is called “caatinga”. It is a high forest of plants adapted to heat and drought. Ever so often the landscape is interrupted by little mountains consisting of limestone called “bambuí”. They are much drier because the soil is very shallow. Climbing them is difficult because the limestone falls apart under your feet and the rocks are very sharp. The bambuís are full of cacti. Quiabentia zehntneri grows on them too, at a height of 450–750 m.
Quiabentia zehntneri is a small shrub up to a tree of some 3 metres. It has a central vertical trunk. The trunk and the branches grow one section every year. At the start of the growing season, every branch makes a new straight continuation and some radial branches, so that the plant ends up with a regular pattern. The branches fall off easily when you touch them, which is an important way of propagation of the plant. Where Quiabentia grows, the place is full of it. The flowers are pink to red. The name Quiabentia derives from the local name for Q. zehntneri, which is “quiabento”. I saw Q. zehntneri on a bambuí near Itacarambi in Minas Gerais. It was August, 20, 2012, so towards the end of the dry season. The plants were quite thin and frail, getting ready to soak up the spring rains.